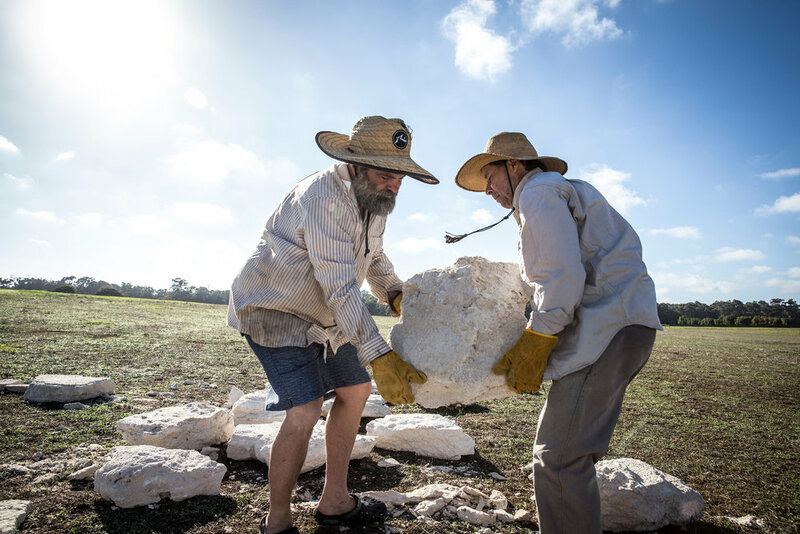 The renowned New Zealand environmental sculptor, worked onsite creating a Kinetic Living Sculpture at The Farm. His sculpture, Waljin Beela, is a site-specific, culturally-sensitive installation, composed mostly of stone and organic materials. It was informed following engagement with the Indigenous custodians and research into the natural history of the area. Chris has made site specific sculptures across Europe, Australia, the U.S.A., and New Zealand. These include the Kroller Muller in Holland, Gibbs Farm in NZ and Wurrungwuri, created in the Sydney Royal Botanical Gardens. This is his first sculpture in Western Australia. For nearly 20 years his Kinetic Living sculptures owe most of their kinetic ability to the action of the greatest recycler on the planet: fungi. Fungi is the supreme terrestrial recycler, the most extensive of all living organisms and is one of our most ancient sources of food and medicine. The sculpture at The Farm, Waljin Beela, will in time witness this fungi recycling. At the beginning of his residency Chris had a vision of a woman in the contours of the land. Following discussions with Elaine Clocherty, Vivienne Brockman an elder Wardandi woman, an anthropologist, geologist and locals , he has completed the first component of the land art form at The Farm. The concept for this artwork emerged from the process as a metaphorical waljin beela or navel, making it the centre of a body - a female body in this case. A navel, as a metaphor, also speaks to the centrality of water in the Indigenous cultural matrix and alludes to the classical ideas of the omphalos stone and the genius loci or spirit of place. Waljin Beela - navel is a circular mound, formed by clearing a circle of turf, stacking jarrah logs in the centre, covering the structure with mineral lime then setting broken slabs of limestone on edge in a spiral to form the final surface. Like Chris’s previous living works the mound will change in shape and colour overtime as natural agents alter its components.